Skybus’s new King Long-bodied MAN 28-310 HOCL-NL articulated buses are excellent performers, according to Allen Matzel. Melbourne Airport operator Skybus regularly updates its fleet. The MAN 28-310 HOCL-NL articulated buses are a case in point. Passengers travelling on Skybus services to and from Melbourne's Tullamarine Airport deserve nothing but the best. And the new articulated buses now entering service deliver on this expectation. World-renowned Melbourne Airport transfer operator Skybus has undergone a fleet replacement program over the past few years. Skybus' policy is to keep the fleet modern through regular replacement, allowing it to provide customers with the most comfortable ride to and from the city and terminal. The latest buses to join the fleet are the first of their type in Australia. They are King Long-bodied MAN 28-310 HOCL-NL articulated buses. Seven of these modern purpose-built airport transfer buses will join the Skybus fleet in the next few months. The buses are imported by Heavy Vehicles Australia (formerly King Long). They join a fleet of Scania articulated 14.5-metre buses running a 10-minute service between Tullamarine Airport and Southern Cross Station (formally Spencer Street Station); there is also a small fleet of mini-buses for hotel transfers. The first King Long/MAN articulated bus entered service with Skybus in late December 2009. They join a fleet that is averaging 5,000km a day and 1.5million km a year. King Long has produced a stylish looking bus that has been specifically built to a special Skybus spec with a seating capacity of 53 and maximum carrying capacity of 94. The buses are fitted with capacious luggage racks to cater for the large suitcases of airline passengers. One of the innovative features fitted on the bus is the Provision Road Hornet system (see separate story pages 42-44) that has eight cameras including one either side at the front covering the full length of the bus. There is an on-board audio visual system that is linked up to the GPS and will trigger the video at different points and show pertinent information. The destination video feed has also been linked up to the GPS and will automatically change at set points along the route. There are three LCD screens positioned throughout the bus, giving all passengers unobstructed view of a screen. Another good feature is LED interior lighting in the front part of the bus to reduce glare on the windscreen at night - a good safety feature with the driver in mind. The bus is fitted with two Coach Air air-conditioner units. The driver has a separate radio and speaker system as well as a boost system for the air-conditioner in the driver's cab. A three-quarter drop blind is fitted to the driver's windscreen. The driver sits on an ISRI 6860 air-ride seat. The dash is a standard MAN city bus unit that is well set out. All gauges, lights and switches are in easy sight and within reach. Stalks on the steering column operate the retarder setting (right stalk); the horn, wipers and indicators are controlled from the left stalk. The entry step into the bus is 430mm (370mm knelt); the bus floor is flat through to after the rear door. Then there is a step of 150mm to the rear saloon. Passengers can find comfort in the 53 King Long seats. In the front section they are mounted on a raised plinth of 230mm and there are two places for wheelchairs on the nearside of the bus with a fold-out ramp at the front door. Powering the MAN 28-310 is a MAN E2876 LUH02 horizontal six-cylinder turbocharged and charge-air-intercooled 12.8-litre engine developing 228kW (310hp) at 2,000rpm and producing 1,250Nm (920ft-lb) of torque at 1,000 to 1,700rpm. The sufficient power made driving the 28-310 a pleasant experience. Acceleration was brisk and in heavy city traffic the bus just purred along - the bus was capable of keeping up with the traffic when needed. On the freeway the MAN 28-310 was happy to cruise at 100km/h, and the internal noise was low, with only minor engine noise being heard. Steering was light and positive with good road feel and the ride was smooth and comfortable. Coupled to the engine is a ZF 6HP604C automatic transmission with integral retarder and the following gear ratios: first 3.43; second 2.01; third 1.42; fourth 1.00; fifth 0.83; sixth 0.59; and reverse 4.84. The electronic brake system integrates the basic electro pneumatic brake (EPB) function as well as the anti-lock braking system (ABS) and anti-spin regulator (ASR). As it adjusts the brake power to the braking situation in hand it also reduces the wear on the parts involved and thus improves the life of the entire brake system. The front axle is a forged rigid axle with disc brakes; model MAN VOK-07-B. The centre axle is a portal axle (non-driven) with disc brakes, model MAN HONP 1300. Finally, the drive axle is a portal axle with differential offset to the left and disc brakes, model MAN HONP 13100. The electronically-controlled air-suspension (ECAS) has two air bags on the front, four on the centre and four on the rear axle. There are two shock absorbers front, four centre and four rear. 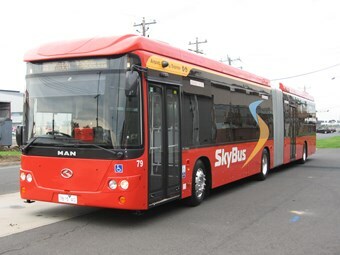 Damien Wadden, Skybus Operations Manager, told ABC that over the next few years that the company will be looking at replacing its 14.5-metre long buses with more articulated buses. All up the MAN articulated bus is an excellent performer, very manoeuverable and easy to drive. If you are looking for this type of bus for your operation the King Long/MAN combination makes for a very good package.